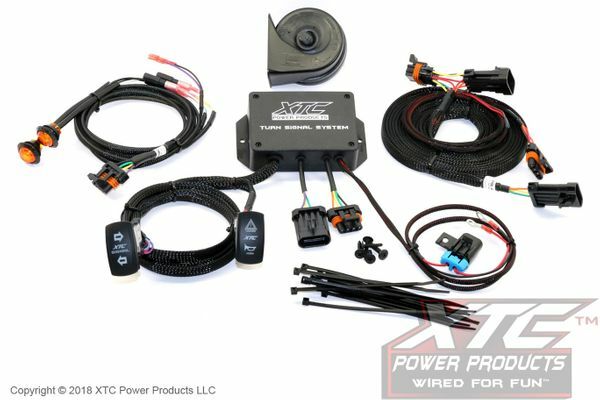 XTC™ Power Products has UTV Wiring Solutions. Their Plug & Play™ Product line offers the TSS-Turn Signal System (Patent Pending). The system comes with a Marine Switch that activates the Turn Signal System and also Indicates with a flashing arrow. It is Easy to install with no wires to cut and no crimping. 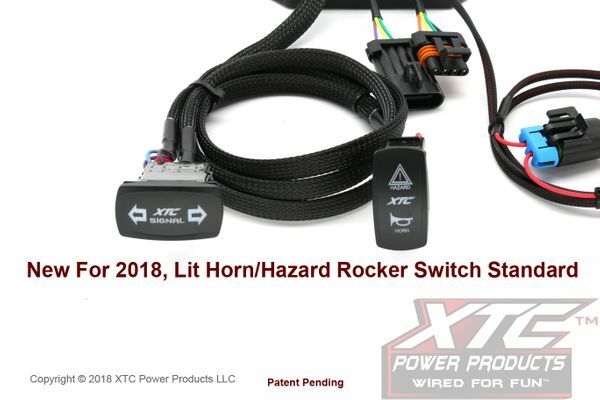 The UTV TURN SIGNAL SYSTEM comes with pre-made wire harnesses that interface with the OEM harness, just unplug the car’s rear light harness connector and plug XTC’s harness in, it is that easy. The brake lights work as turn signals just like a car including Hazard Lights. It includes a lit Hazard Switch and rear power out for the license plate light or whip light. XTC Power Products are made in America. XTC™ Gets You Wired For Fun™! They have turn signal kits for most RZR’s the Ranger XP 1000 and 900, the General, Yamahas, Can-Am’s X3 and Defender and Honda Pioneers along with a universal kit starting at $329.99.